"Prospector" redirects here. For other uses, see Prospector's Charm. 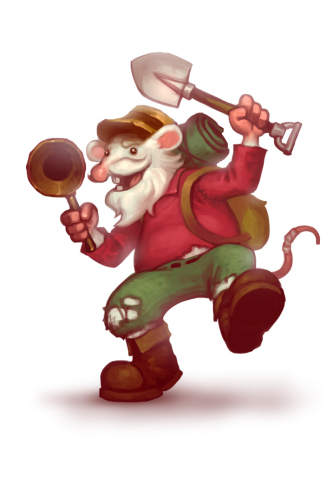 The Prospector mouse is a breed of mouse found in the Claw Shot City. This mouse is also a part of the Dirt Dealers gang when working on a Wanted Poster. Required Power Types: Law Other Requirements: ?? Claw Shot City, said to be built off the backs of foolish dreamers looking for rare minerals. Many Prospector mice have come and gone, some have even found small fortunes, but still a select few remain. Vigilant in their search, they will never give up the dream that one day they'll strike the motherload! Hunters who are lucky enough to find a Prospector Mouse who is ALSO lucky enough to have found some Fool's Gold will be rewarded with a small handful of the rare stuff. Prospector's Charms are also a great way to attract more of these busy mice, and they give your Law trap a needed power boost! Law type traps such as S.L.A.C. are very effective against Prospector Mouse. Released on 25 June 2013 as part of the Claw Shot City content. This page was last edited on 9 April 2017, at 01:39.